There is no save wildlife comeback in Europe until we manage to generate a wide public support for nature conservation. Here comes another example of brutal wildlife poisoning in Serbia. Based on a report from Tanjug! 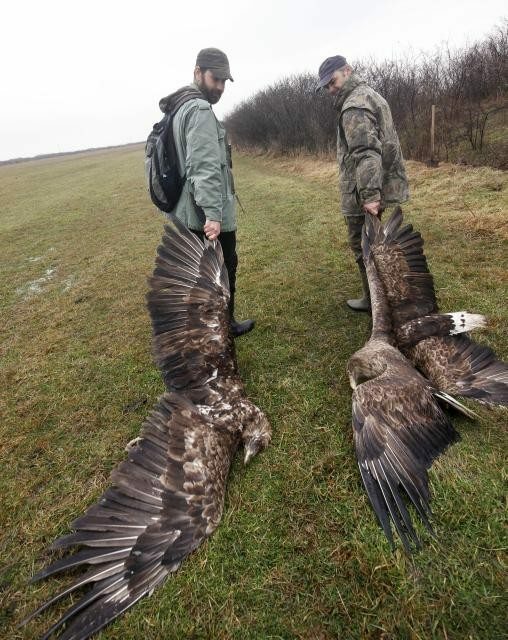 In the municipality of Apatin, Serbia, not far from the settlement the bodies of 4 dead white-tailed eagles (Haliaeetus albicilla) were found. The birds were likely poisoned.The bodies of three buzzard (Buteo buteo), seven magpie (Pica pica) and two jackals (Canis aureus) were found in the same area. This case is a sad example of the relationship of human to nature, given that this area is one of the most important nesting habitat for several rare and endangered species. Is there specific legislation prohibiting this? If so, the best thing one could achieve is to create awareness through prosecution of the perpetrators of the crime… This may discourage others from doing the same. The trial needs to reach headline news for it to be effective. The other thing is to work closely with farmers who are facing problem animals like jackal, by offering them alternative solutions to poisons. If farmers insist on using poisons, try to convince them to put it out in the evening, and to remove the poisoned carcass in the morning, as well as picking up any dead jackal if found. This way the poison is more likely to only reach the target animal that is nocturnal and leave the birds of prey un harmed.